Stitch using uneven basting along the roll line using silk basting thread ensuring you only catch a thread of the fashion fabric when stitching through hair canvas. 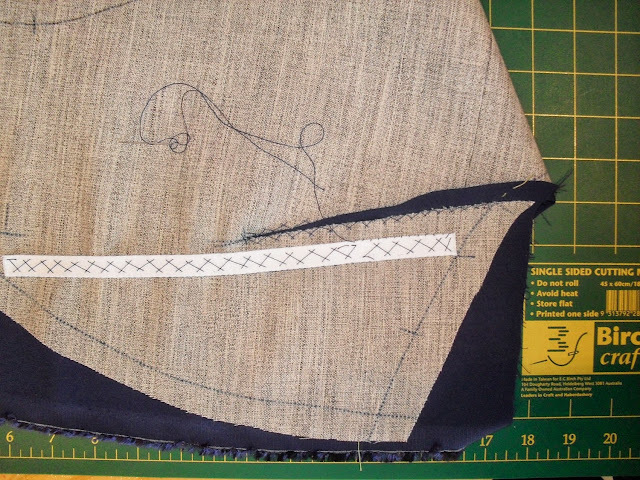 Cut a length of twill tape 10mm shorter than the roll line and pin ends to end of roll line. Smooth out to distribute ease evenly and catch stitch tape in place again ensuring you only catch a thread of fashion fabric through hair canvas. Fell stitch along the edges to hold them down nice a flat.